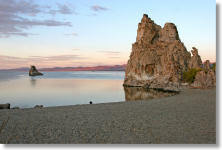 Why Hike the Mono Lake Tufa Trail? Wandering among the tufa towers here is an otherworldly experience, perhaps most comparable to touring a cave filled with stalactites and stalagmites. The key difference, though, is that caves don't have sunsets to light them up and huge lakes to reflect the sunsets in. Also - no disrespect intended to spelunker sensibilities - the tufa towers are far more creative in their architecture than the simple pointy towers you find in your standard cave. Think Gaudi lefthanded or Seuss with a hangover. Distance from Yosemite: The trailhead is 22 miles (35 km) southeast of Yosemite's Tioga Pass entrance. Best Time to Visit: At sunrise and sunset, when the sky and tufa light up in shades of orange and the lake reflects it all. Difficulty: 1 out of 10. Hikes don't get easier than this, except possibly Washburn Point. Crowd Factor: It's not quite Lower Yosemite Falls, but there are still lots of people popping in and out all day long. Tripods and their photographers can be abundant around sunset. Parking: There's a large lot at the trailhead. Nearest Snacks: Try the fab Whoa Nellie Deli at the intersection of the Tioga Road and Highway 395, 10 miles (16 km) northwest of the trailhead. Foodies everywhere agree that you'll never find a finer restaurant inside a Mobil gas station that used to have a 20-foot trapeze swinging in the breeze beside it. 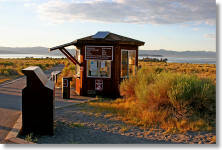 It's also got outside seating with views of Mono Lake. From Yosemite's Tioga Pass (eastern) entrance, take the Tioga Road 12 miles (19 km) east until it ends at Highway 395. 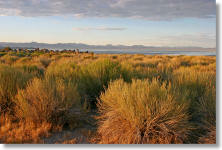 Turn left onto 120 east and drive another almost-5-miles (almost 8 km) to the turnoff for the South Tufa trail. From here it's one mile (1.6 km) to the trailhead; the last 0.9 miles of the road are unpaved. The turnoffs are all well-marked and shouldn't be hard to find. Environmental Irony Department: We'd never have seen all these fabulous tufa towers without the aid of the sort of water-rights skulduggery that inspired Jack Nicholson to get his nose slit open and slap Faye Dunaway around in Chinatown. 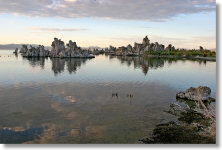 The tufa is limestone that forms when calcium-enriched springs flow up into and react with the lake water - in other words, it only forms underwater. The towers are above the waterline now because the city of Los Angeles began diverting the streams that feed the lake in 1941, lowering the lake's level by more than 40 feet. Since a Water Board ruling in 1994, the lake has been gradually refilling to its 1963 levels; when it's done, part of this trail will be underwater again. So don't put your visit off for too long. 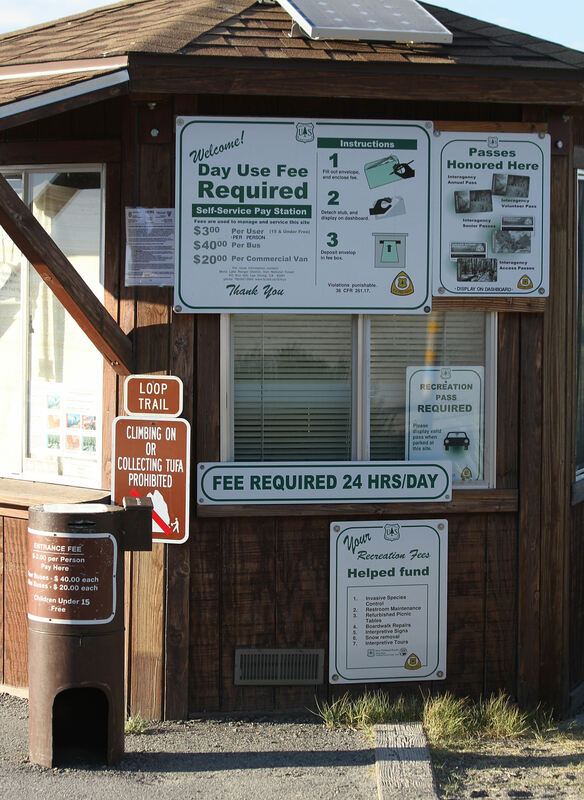 Admission: Your Yosemite pass is no good here. You'll have to pay $3 admission for everyone in your party older than 15. Owing to California's budget machinations, though, there won't be anyone at the entrance booth to take your money; instead, you're supposed to deposit it in one of the pink payment envelopes found there and	then tear off the proof-of-payment stub and hang it from your car's rear-view mirror. Though Yosemite passes don't work, national park passes (officially known as "interagency passes") and senior passes are accepted - leave the pass on your dashboard before you start the hike to avoid getting ticketed. Here's a photo of the admission booth adorned with signs describing the various legal ways of gaining entry. 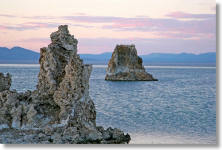 Already been to Mono Lake? Add a Review. Also There is Brush Here!